All models include Ableton Live Lite software. The smallest of the Rubix range, the Rubix22 can process two simultaneous record (input) channels and two simultaneous playback (output) channels. Power supply is via USB, 5V DC from a connected computer. 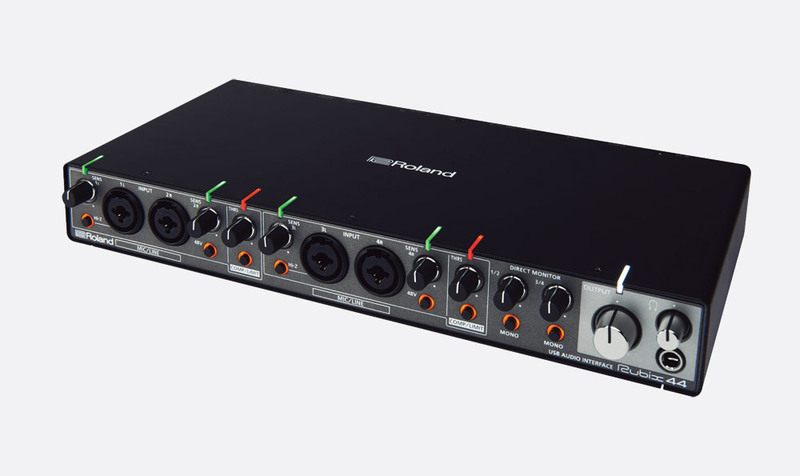 The front panel has two balanced, combination XLR/6.35mm jack inputs, each with a rotary input sensitivity control. A larger rotary control functions as a main output volume control. Each of these rotary controls has an associated multi-colour LED to offer striking visual indication of good or over driven input or output. These LEDs are mounted on the edge of the case, and can be seen on both the front and the top. Below the sensitivity controls there are two latching switches; these are illuminated with a annular glow around the circular button of the switch. The functions of the switches are: Hi-Z (high impedance) on input '1L' and phantom power on/off, A 6.35mm jack socket with associated rotary volume control provides a headphone output. 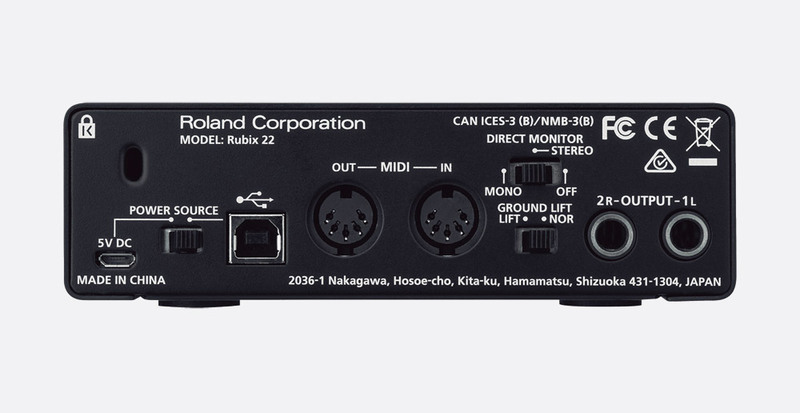 The rear of the unit has all other connectivity, including two balanced outputs (2k ohms, jack sockets), MIDI I/O and an option of power source input via type B USB or micro B type with selector switch. There is a ground-lift switch, headphone source maybe switched between the two pairs of outputs, 'loopback' may be turned on or off and the 'Direct Monitor' may be set to 'Mono', 'Stereo' or 'Off'. Dimensions: 145 x 165 x 46 (WxDxH) mm. Weight: 1.0kg. This has all of the functionality of the Rubix22 with some added switching and connectivity to cater for the two input channels and increased number of four output channels, and therefore a slight larger footprint. 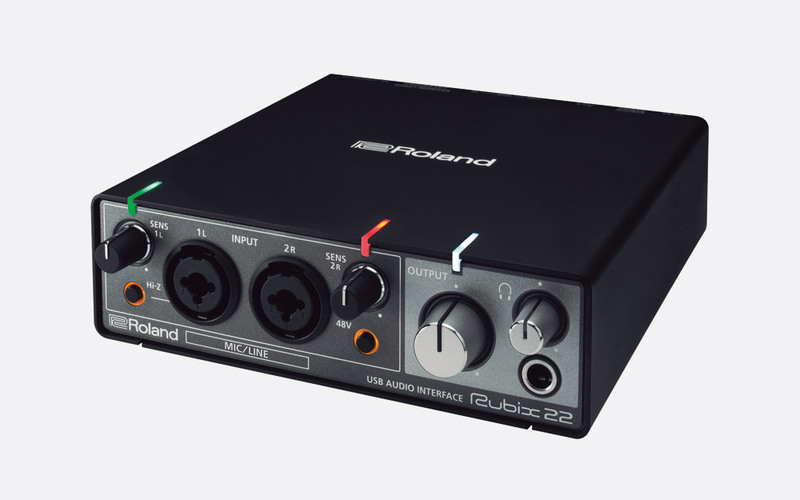 The front panel shares the input, main output and headphone monitoring facilities of the Rubix22. An additional illuminated, latching on/off push-button and rotary control sets the threshold level of a hardware compressor/limiter status. A multi-coloured LED positioned above them gives visual indication of compressor/limiter activity. A final rotary control allows the user to mix between playback and input channels, and a push button allows switching to mono for the direct monitor output. The rear panel has the same type B and micro type B USB power inputs as the Rubix 22, along with MIDI I/O, four balanced 6.35mm jack outputs, and switching for ground lift, 'loopback', compression/limiter type ('Comp1', 'Comp2', 'Limit)', and headphone source. Dimensions: 183 x 165 x 46 (WxDxH) mm. Weight: 1.2kg. This is the largest of the Rubix series with four input and four output channels, weighing 1.8kg. 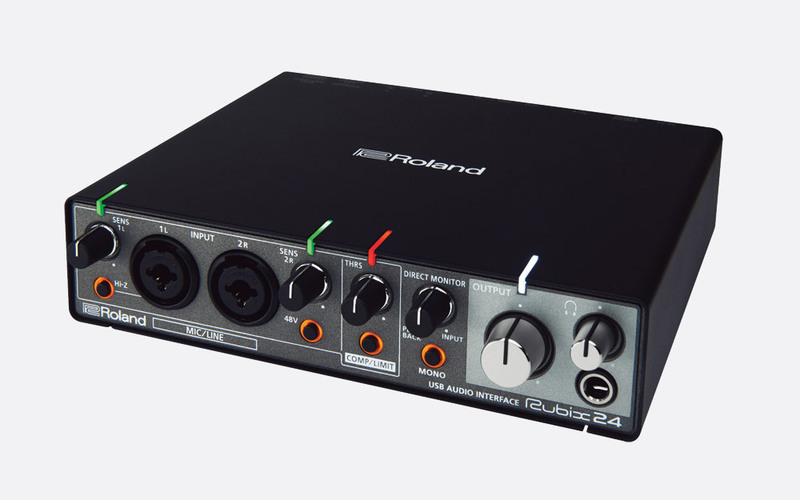 In addition to the functionality of the Rubix24, the Rubix44 has four, rather than two, balanced XLR/6.35mm jack combination inputs and two, rather than one, sets of compression/limiting switching and threshold adjustment controls, which affect channels 1/2 and 3/4 respectively. Two separate sets of, 'direct monitor' controls allow the user to mix between channels 1 and 2, and 2 and 4 respectively. Each set has a mono switch. The rear panel has similar functionality and connectivity to the Rubix24 with the addition of a second 'comp/limit' type selector for channels 3 and 4. In place of the micro B type power inlet, the Rubix-44 has a single power inlet for use with the included PSB-1U power supply. An on/off switch allows for power switching. Dimensions: 310 x 165 x 46 (WxDxH) mm. Weight: 1.8kg.